In Magento 2.2.5, I am creating admin grid by following this tutorial(Using layout Block method. Not UI Component). In that I have a add button. I can't remove it. I need to remove it and add a new button with custom url. How to achieve this. Not the answer you're looking for? 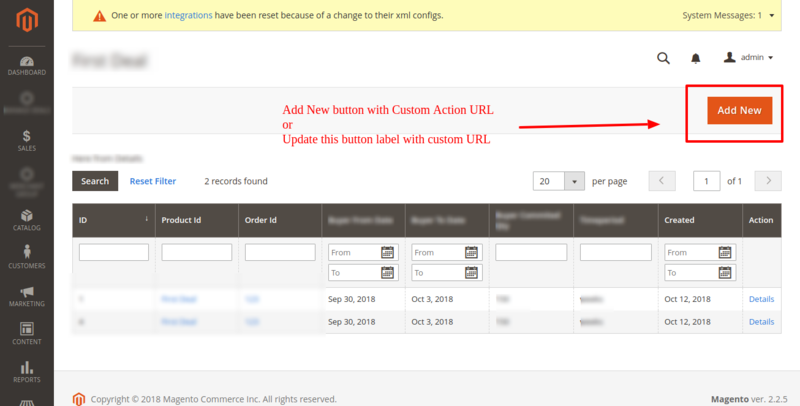 Browse other questions tagged admin grid magento-2.2.5 custom-button or ask your own question. How to remove ‘Add New’ button from Admin Grid in Magento 1.9? Magento2: How to remove ‘Add New’ button from Admin Grid? How to add Upload Button for importing a csv file in the Custom Admin Grid Container in magento 2?